Become a Laundry Lady Licensee and control your own future, work schedule & work/life balance. When you become your own boss, you will enjoy finding new customers that will benefit from your business (residential and/or corporate) and begin to create additional income. Starting your laundry business requires that you feel comfortable with customer service related issues and marketing yourself within your service area. There are a lot of amazing advantages that will come with being an entrepreneur. Your ultimate goal is to focus on finding and retaining new customers. When you provide something that people actually need and want, sales will follow. What does it mean to be a Licensee with Laundry Ladies Inc.? Becoming a Laundry Lady Licensee allows you the comforts of starting your own business without the hassle of creating a new website, setting up a new email address, figuring out an invoicing system, understanding branding etc. You are your own boss. You will be considered a Licensee/Independent Contractor. This means that you are self-employed, running your own business, yet you are part of an already established company. Essentially, you don’t have to re-create the wheel, we have done it already! You can set your own work schedule and hours of operation. You will determine your own pricing structure for your business and how far you are willing to drive to accept new customers. You are responsible for any expenses you accrue with your Laundry Service business. Items pertaining to your business are usually accepted as write offs for your end of the year taxes (please consult with your tax accountant for additional details/questions). No taxes will be taken out of your monthly paychecks. You will be responsible to submit the Laundry Ladies, Inc., 1099 MISC form to your personal tax accountant at the end of each calendar year. Your relationship with the Laundry Ladies, Inc. is that of an independent contractor/licensee, and nothing in these guidelines, the Term of Use, or any additional agreement is intended to, or shall be construed to create a partnership, agency, joint venture, employment or similar relationship between you and the Laundry Ladies, Inc.
What does it cost to become a Laundry Lady Licensee Member? Once your application is APPROVED to become a Laundry Lady Licensee, you will receive a formal Application Kit via email. How will I make money and what else is included as a Laundry Lady Licensee? Am I eligible for Health Insurance? As a Licensee/Independent Contractor you will not receive any of the benefits that we may make available to our employees, such as group health or life insurance, profit sharing or retirement benefits. How do I handle taxes as a Licensee of Laundry Ladies, Inc.? You are solely responsible for, and will file, in a timely manner, all tax returns and payments required to be filed with, or made to any federal, state or local tax authority with respect to the services and receipt of compensation from us. Yes, we will regularly report amounts paid to you by annually filing a 1099 MISC with the Internal Revenue Service as required by law. No part of your compensation will be subject to withholding by us for the payment of any social security, federal, state or any other employee payroll taxes. How does Laundry Ladies, Inc. payment processing system pay me? Your customers will be paying their invoices through a payment processing company, which in turn will pay the Laundry Ladies, Inc. directly. You will be paid monthly based on invoices that have been paid and cleared. You will send an itemized list of completed/paid-in-full jobs, including total charges from your customers invoices. This list will be matched against our payment processing system financials. After confirmation of totals are complete, payment will be made to you once a month. Each Laundry Lady licensees’ portion of each individual invoice will be 70%. Laundry Ladies, Inc. portion of each individual invoice will be 30%. How do I determine my Laundry Service rates? What do I charge my customers? It is recommended that you do research in your specific area. Find out if there are any fluff and fold services, laundry valet services, dry cleaners that offer laundry service by the pound, etc.… and see what they are charging. Shop your potential competition! Remember you are a pickup and delivery service with a personal touch and 24 hour turn around-this has value! Think of yourself as a concierge service. You want to take the hassle out of laundry for your clients. Factor in how far you are willing to travel for pickups (a certain mile radius) and if you want to charge a fee for pickups/deliveries outside that radius. You will need to observe all anti-harassment and non-discrimination laws in the performance of your services, your interaction with your customers and any dealings with Laundry Ladies, Inc.
Do I need a valid Driver’s License and Auto Insurance? Yes to both. At a minimum you must carry liability auto insurance. Do I need to own a Washer & Dryer at home? How will I accept client payments for my Laundry Services? As a Laundry Lady Licensee, you will be provided with access to our corporate Invoicing System. All Laundry Lady Licensees are required to use this invoicing system for all customer payments. 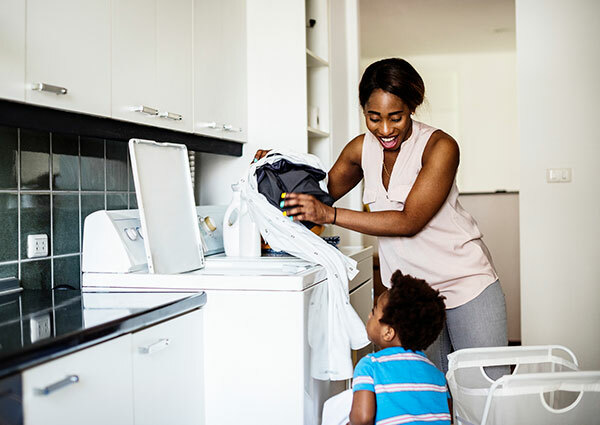 Laundry Ladies, Inc. Payment Processing division will handle the connection of funds and process your customer invoices. This will be based off your predetermined rates, rules and completion of your customers laundry pickup. What if my customer has a problem with the payment system? Please alert Laundry Ladies, Inc. immediately via info@laundryladies.com. How will I keep track of my growing list of customers? How will I communicate with my customers? It is recommend that you discuss and schedule all pick ups directly with your customer via phone, email or text. You should always honor the laundry service pick ups as agreed to by you and your customer. Always maintain a professional and courteous demeanor when communicating with your customers. What types of detergent should I use? It is recommended you use a detergent that is considered “free and clear” free of scent and dyes to minimize the potential for allergies. Unless of course a customer requests something specific. What should my laundry room/work area look like? Keep a very clean work area. No animal hair, dirt or excessive dust when working with your customers clothing/items. You want to avoid the potential for damaging your customers laundry or creating unwanted allergies. You are in the business of cleaning laundry, not creating additional work for your customer. We are so excited that you have opened up this page for more details. It means that you are considering the possibility of becoming your own boss. We would be delighted to assist you in that vision/dream. Most Laundry Ladies and Laundry Lads, choose this line of work to enjoy all of the benefits of working from home and being their own boss. We would love to help you find out if this is the right fit for you. To begin the process click on the APPLICATION LINK at the bottom of this page. How do I access my Laundry Ladies Licensee email?